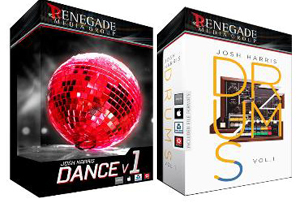 Renegade Media Group announces Josh Harris Dance Volume 1 and Josh Harris Drums Volume 1. Both products feature top-quality content for royalty-free use in Dance, Electronic, Urban music production. Harris recently used content from his dance library on remixes of Beyonce's "Sweet Dreams", Passion Pit's "The Reeling" and Jordin Sparks "Battlefield". "Being full-time producers, we know what kind of content it takes to produce and remix today's hits," said Harris. "Our professional work is also our benchmark for quality control. We only offer content for sale in our products that we would use in our own productions. In addition to other work, I recently used samples from Josh Harris Dance Vol. 1 in a soon-to-be-released remix of Sky Ferreira's 'Obsession'." Josh Harris Dance Vol. 1 includes 15 construction kits with tempos ranging from the mid 120's to mid 130's and incorporates Josh's different styles as a remixer and producer. There is also additional content part of the library that is loaded with over 500 MB of drum loops, bass lines, keyboards and Standard MIDI Files. The additional content tempos are 126 and 130, with bass and keyboard parts in 5 different keys, making key transposition as well as mixing and matching keys between the files quick and easy. The library is available in Acidized Wave Files, Apple Loops, Rex2, and Reason Refill, totaling 1.67 GB in size. Josh Harris Drums, Vol. 1 is a meticulously assembled library of 24-bit/44.1k drum loops. With over 500 MB of content, the tempos range from 80 to 140 BPM and the styles are all in the electronic and dance. Each loop has five variations: a full loop, a no kick loop, and three other manipulations, ranging from bit crushing to phasing, filtering and distortion. This library is also available in Acidized Wave Files, Apple Loops, Rex2, and Reason Refill formats. Pricing and Availability: Josh Harris Dance Vol. 1 is available for $79.99 USD and Josh Harris Drums Vol. 1 is available for $29.99 USD. Product information, audio samples, and ordering information are available at http://www.renegademediagroup.com.